Hello guys! Throwback to when I was in England and planning for the English autumn weather which I’d actually never see because I now live in L.A! Ah well, this renders half of my closet useless so of course I had to pretend it was cold and dress for it. 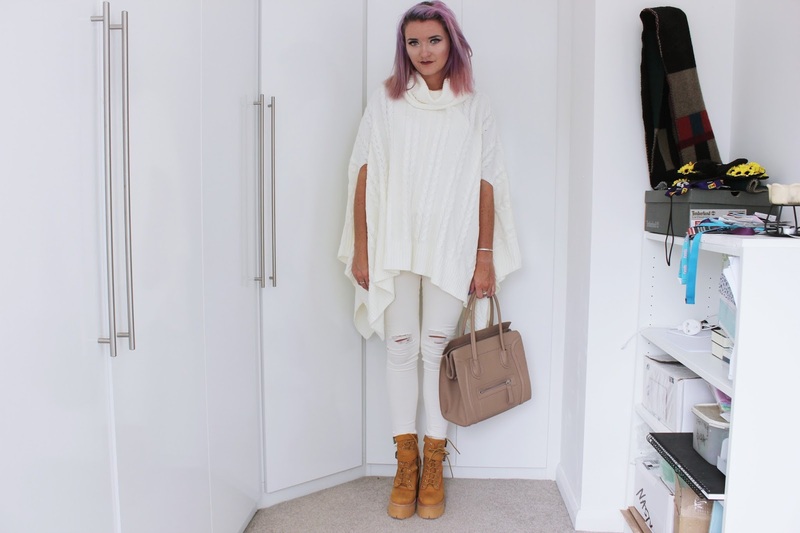 I love wearing all white and if I were less clumsy around food I’d do it a lot more often. These Topshop jeans are an off white/cream colour and also have distress holes around the knees and thigh. They’er super super skinny so stick to me like a second skin but I couldn’t wear any other kind of jeans as it would just feel far too baggy! 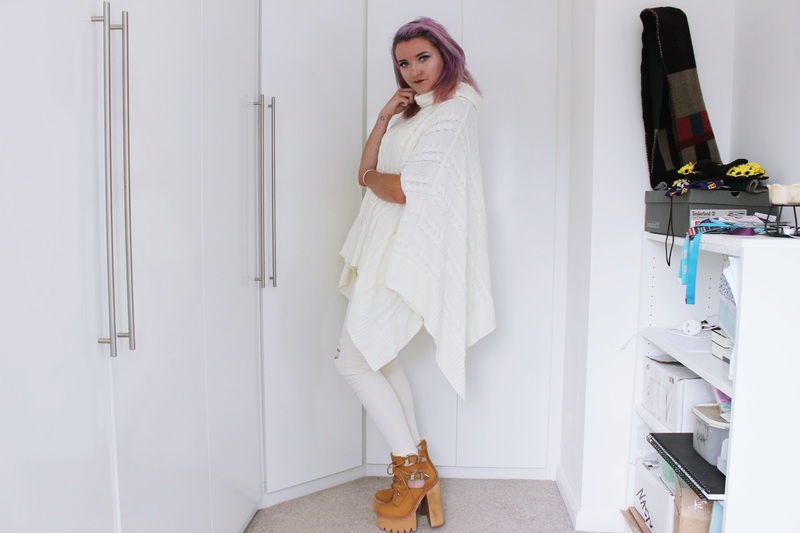 The turtleneck jumper/cape works really well with the jeans but it just slightly a different colour so I don’t look too matchy-matchy. I’m always really careful around knitwear because I hate the kind that makes you really itchy – I can’t stand 5 minutes in clothing like that! Fortunately this material is really soft and itch free. I’m not a massive fan of turtle necks because I hate the tight ones that stick to your neck because I feel really restricted. This turtleneck is perfect because it’s super baggy and gives me load of space so I can actually breathe. My shoes are from the shoe god Jeffrey Campbell they’re like a badass high heel/platform version of the Timberland boot. They’re honestly bigger than most guys dicks – no lie. They’re super comfy and really hug your foot. I always feel like that really helps in order to not fall over in high heels. The heels I own that aren’t like a second skin means that my foot can move around (even if it’s only millimetres) which can often throw your balance and maybe cause yourself to fall over – not cute. These shoes have laces and strap buckles which you can tie tight and fit tight to your foot and ankle. They really aren’t going anywhere. I feel that these high heels work really well with jeans because you can tuck jeans into them which brings attention to the shoes. Cute. What do you guys think of the outfit? Do you hate turtleneck’s too? Are the shoes something you’d dare to wear? If so what would you wear them with?